Pop Culture and critical theory belong together. That's the thesis I've been pushing at Storming the Ivory Tower. By digging into pop, fandom, and marginal culture using tools normally reserved for High Art and Literature, I give everyone access to ideas otherwise reserved for academics. With articles on topics like the intelligence of Pacific Rim, the important place of Homestuck in comics history, or the critical potential of fan games spreading far and wide on the web, and with a stable of ebooks, podcasts, and esoteric review projects, StIT has become a site of experimental criticism with a wide scope of subjects but a simple goal: to storm and sack academic "Haute Couture" with the armies of Gutter Culture. After several years of Storming the Ivory Tower articles, it can be hard to know where to start, and also tricky to navigate the different experiments, special releases, and side projects published on my Patreon. This guide is designed to provide some clarity on what the website offers. These pieces are all among the blog's most popular, and they're all also articles that I think hold up particularly well. Still my absolute most popular article, this piece analyzes the way Pacific Rim uses visuals rather than dialogue to primarily convey its epic narrative. While many critics at the time praised it for "knowing it's dumb," I suggest instead that it knows how to be intelligent--visually intelligent. This piece argues that the hypercomic Homestuck is best understood as a Gnostic Christian narrative, one where the characters struggle to overcome and transcend a reality constrained by a malevolent Demiurge. This article is notable for having been written four years before the end of Homestuck... and for having predicted the basic movement of the ending perfectly. Jumping from theme to form, this article analyzes one particularly inventive sequence of Homestuck as a jumping off point for some other thoughts about hypermedia, experimental storytelling, and giving actual weight to your technological experiments. This piece takes a look at two episodes of wildly popular cartoon Steven Universe and analyzes a bunch of art appearing in the show, applying my background studying early 20th century art to show how a sculpture made out of toilets can have revolutionary and personal significance, and how art can still matter in the face of war and trauma. Diving into the murky waters of "difficulty" in gaming, I analyze the now-active-again Seeking Mr Eaten's Name in hit online narrative game Fallen London, and why I'm so excited to play a game designed to be unpleasant, tedious, and self-destructive. Another article digging into the intersection between art history and pop culture, this piece looks at Mad Max: Fury Road's use of Sublime landscapes, putting it in the same tradition as folks like William Turner and giving us some real interesting insight into the place of humans in Max's post-apocalyptic world. Shinji Ikari, protagonist of famous mindscrew anime Neon Genesis Evangelion, is blatantly canonically queer, attracted to both male and female characters throughout the series. So why exactly is it so hard for the fandom to admit that he's not straight? And what does recognizing his queerness do for our understanding of the show? This trio of articles analyzes the character Grant Ward from Marvel's Agents of SHIELD (back when that show was watchable) and explores the way his character deconstructs heroic masculinity within superhero narratives. This set of articles eventually became the backbone for my first article collection, My Superpower Is Manpain. Janelle Monae is the most important person working in contemporary science fiction. So why does it seem like traditional geek culture outlets have given her brilliant, multi-modal hip hop concept albums a cold shoulder? I confess, this article isn't really that popular, but it remains one of my favorite pieces and one of my more personal ones as well, delving into Kamelot's symphonic metal concept album Silverthorn, the way it falls into a tradition of hauntological horror, and the way that horror is used to explore trauma and cycles of violence and abuse. Sometimes a work just can't sustain a full article, or is too obscure to justify the effort of creating one of my large posts. Those works get discussed instead in my Patreon-exclusive Reviews series, a collection of shorter text pieces available for $1 backers here. Curious about what these look like? Periodically I collect a few of the reviews into a larger post, which I post as a compilation article on the main site. You can view those here. The Storming the Ivory Tower Podcast, which is archived on Patreon here. I write my articles by speaking them first, and then I edit the audio files into podcast versions of my articles. This is a looser, more stream of consciousness take on my articles, often including material not in the final pieces. Let's Read Theory recordings, where I translate Theory texts into more accessible terms and explain their value. Some of these are exclusive to my Patrons, but several, including a discussion of major Reader Response theory essays, and an analysis of the Object Oriented Ontology text Vibrant Matter, can be freely accessed under the Let's Read Theory tag. Periodically I release collections of thematically-linked articles, edited and with new exclusive content. So far, there are four collections, which at the moment can all be accessed together through Patreon (though check the store to find collections released on other platforms). 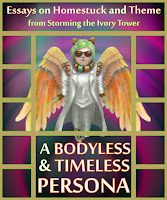 A Bodyless and Timeless Persona: Essays on Homestuck and Theme covers four previous essays from Storming the Ivory Tower exploring everything from Gnostic themes in Homestuck to the way the comic makes use of difficulty. 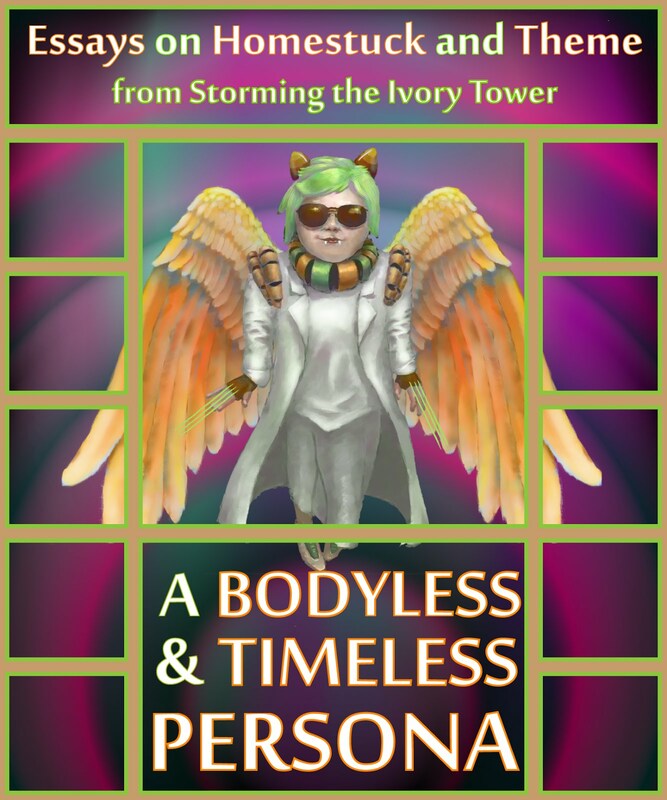 Additionally, the collection features an exclusive triple-length article, "Is There A Text In This Classpect?," which explores all the different possible answers to the question "just what is a character in Homestuck?" This collection aims to be a starting point for anyone interested in delving deeper into the meaning of the comic and its complex and rewarding mythology, symbolism, and narrative experimentation. 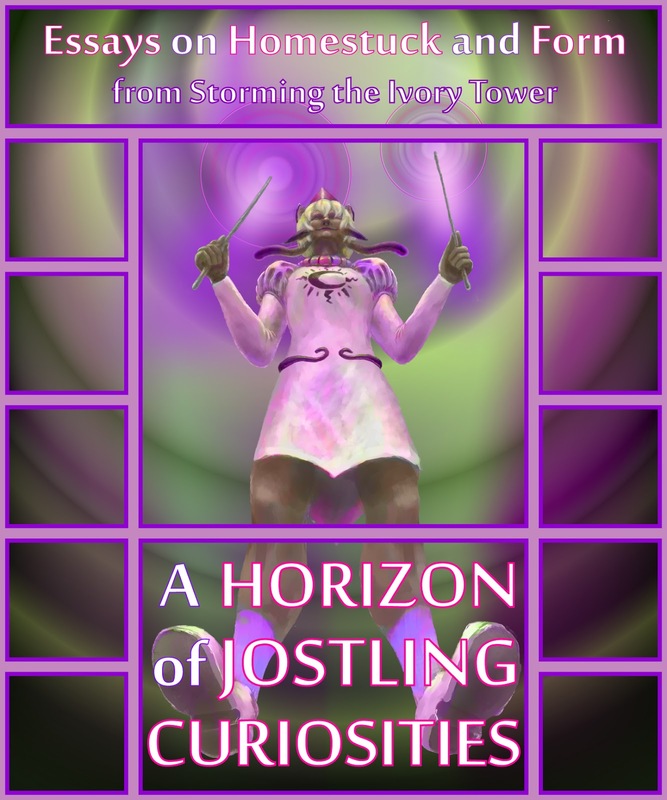 A Horizon of Jostling Curiosities: Essays on Homestuck and Form analyzes Homestuck in the context of the new hypercomics boom that it inspired. 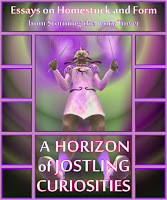 Containing newly revised and updated versions of five articles from Storming the Ivory Tower on Homestuck's formal techniques, the book places them alongside brand new and exclusive reviews of works like Awful Hospital, Ava's Demon, and Neokosmos, digging into the techniques and technologies that make these comics possible. Laying out the history of hypercomics for the first time, this book is an essential read for anyone looking to better understand why Homestuck is successful, and the possibilities that its formal techniques offer. 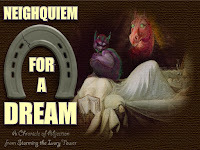 Containing all my articles on My Little Pony: Friendship is Magic and one all new exclusive article, Neighquiem for a Dream charts the early promise of the show and its fandom, all the way to its slide into ignominy and disaster! Starting with one of the first articles that put me on the (admittedly fairly small) map as a blogger, this collection covers a long history of StIT articles and is accompanied by brand new commentary exclusive to this collection. Additionally, an exclusive article appearing only in this collection, "Trans Night Mare," examines the recent episode Brotherhooves Social and what its use of the transphobic "Man in a Dress" trope represents from my perspective as someone who began my gender transition alongside the growth of MLP's popularity. Featuring revised versions of my articles on The Dark Knight Rises, Arrow, and Grant Ward from Agents of SHIELD, My Superpower is Manpain! explores the idea of the male superhero and his power to warp the narrative and the ethics of a story around himself. In addition to these updated versions of past articles, now with new illustrations, the collection also includes an all new, exclusive article entitled Hugging the Joker, which grapples with the theme and legacy of Alan Moore's famous Batman comic The Killing Joke. This is the post that started it all. Later, it was established that the blog is helped in some unspecified way by Lord Humongous, The Ayatolla of Rock n' Rolla. Eventually I moved the pub that StIT takes place in to the Red Spot of Jupiter. This did serious damage to the integrity of the blog in the literal sense that it was not meant to withstand Jupiter's icy winds. As a result, I died, and ascended to God Tier. I then moved our location to a zombie apocalypse world, a vast underground world filled with monsters, and... another vast underground world filled with monsters. On the way I picked up a bunch of alternate timeline versions of myself, all of whom are terrible. My blog was taken over by a much better adjusted version of myself. And that's the true story of how I got where I am today.